Can You Mic The Drum Kit Please? To keep the drum sound tight, turn off mics not in use in a particular tune, use a noise gate on each drum mic, and/or overdub the drums. What’s the first step in getting a great drum sound? Tuning the drums so they sound good live in the studio! If the set sounds poor, you’ll have a hard time making it sound good on tape. To reduce ugly overtones, try to keep the tension the same around the head. While touching the center of the head, tap with a drumstick on the head near each lug. Adjust tension for equal pitch around the drum. If you want a downward pitch bend when the head is struck, loosen one lug. With the kick drum (bass drum), a loose head gives lots of slap and attack, and almost no tone. The opposite is true for a tight head. Tune the head to complement the style of music. For more attack or snap, use a hard beater. Tune the snare drum with the snares off. A loose beater head or top head gives a deep, fat sound. A tight beater head sounds bright and crisp. With the snare head or bottom head loose, the tone is deep with little snare buzz, while a tight snare head yields a crisp snare response. Set the snare tension just to the point where the snare wires begin to "choke" the sound, then back off a little. Usually the heads should ring without any damping. But if the toms or snare drum ring too much, put some plastic damping rings or handkerchiefs on them. Oil the kick-drum pedal to prevent squeaks. Tape rattling hardware in place. Sometimes a snare drum buzzes in sympathetic vibration with a bass-guitar passage or a tom-tom fill. Try wedging a cottonball between the snares and the drum stand. Or tune the snare to a different pitch than the toms. Now you’re ready to mike the set. Fig. 1 shows typical mic placements for a rock drum set. Let’s look at each part of the kit. 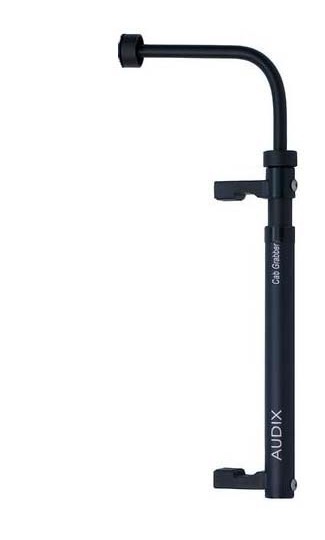 The most popular type of mic for the snare is a cardioid dynamic with a presence peak. The cardioid pattern reduces leakage; its proximity effect boosts the bass for a fatter sound. The presence peak adds attack. You might prefer a cardioid condenser for its sharp transient response. Bring the mic in from the front of the set on a boom. Place the mic about 1" in from the rim, 1-2" above the head. Angle the mic down to aim where the drummer hits. Or attach a mini condenser mic to the side of the snare drum so it "looks at" the top head over the rim. Some engineers mike both the top and bottom heads of the snare drum, with the microphones in opposite polarity. A mic under the snare drum gives a zippy sound; a mic over the snare drum gives a fuller sound. Whenever the hi-hat closes, it makes a puff of air that can "pop" the snare-drum mic. Place the snare mic so the air puff doesn’t hit it. 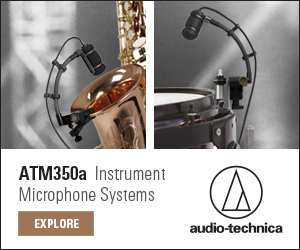 You probably won’t need a hi-hat mic because the hi-hat is picked up by the snare mic and overhead mics. If you want to mike it anyway, try a cardioid condenser mic about 6" over the cymbal edge that is farthest from the drummer. To avoid the air puff just mentioned, don’t mike the hi-hat off its side; mike it from above, aiming down. This also reduces snare leakage. Mike the toms individually, or put a mic between each pair of toms. Place a cardioid dynamic about 1" over the drum head and 1" in from the rim, angled down about 45 degrees toward the head. Again, the cardioid’s proximity effect gives a full sound. Another way: clip mini condenser mics to the toms, peeking over the top rim of each drum. If the tom mics pick up too much from the cymbals, aim the "dead" rear of the tom mics at the cymbals. If you use a supercardioid or hypercardioid mic, aim the null of best rejection at the cymbals. Place a blanket, pillow or carpet pad inside the drum, pressing against the beater head to dampen the vibration and tighten the beat. The blanket shortens the decay portion of the kick-drum envelope. A popular mic for kick drum is a large-diameter, cardioid dynamic type with an extended low-frequency response. For starters, place it inside on a boom, a few inches from where the beater hits. Mic placement close to the beater picks up a hard beater sound; off-center placement picks up more skin tone, and farther away picks up a boomier shell sound. Kick drums often need a fair amount of EQ to sound good. A cut of several dB around 400 to 600 Hz removes the "papery" sound, and a boost around 2.5 kHz to 10 kHz adds click or snap. You should hear both a low-end thump and an attack transient. A popular mic choice is a cardioid condenser with an extended high-frequency response. Place the overhead mics about 2-3′ above the cymbal edges; closer miking picks up a low-frequency ring. The cymbal edges radiate the most highs. Place the cymbal mics to pick up all the cymbals equally. If your recording will be heard in mono, you might want to mount the mic grilles together and angle the mics apart (see Fig. 1, position "A"). Or use a stereo mic. Recorded cymbals should sound crisp and smooth, not muffled or harsh. Consider rolling off all the lows and boosting the highs a little on the cymbal mics. In addition to the close mics, some engineers use a distant pair of room mics when they record drum overdubs. Place the mics about 10′ or 20′ from the set to pick up room reverb. When mixed with the close-up mics, the room mics give an open, airy sound to the drums. Popular room mics are omni condensers or boundary mics taped to the control-room window. If there are not enough tracks for room mics, try raising the overhead mics. Sometimes the set can be miked simply. Omit the tom mics and hi-hat mic shown in Fig. 1. Place a stereo mic (or two mics) overhead and put another mic in the kick. If necessary, add a snare-drum mic. This method works well for acoustic jazz and traditional country music. For a fuller sound on the toms, boost the lows a little in the overhead mics. Even simpler: Mike overhead with one cardioid condenser mic, and maybe put another mic in the kick drum. To keep the drum sound tight, turn off mics not in use in a particular tune, use a noise gate on each drum mic, and/or overdub the drums. Another trick is recording "hot." Using an analog multitrack, record the drums at a high level so they distort just a little. It’s also common to compress the kick. A drummer might use drum pads, or drum triggers, fed into a MIDI sound module. Record direct off the module. Mike the cymbals for best sound. Fat at 200 Hz, crack at 5 kHz. If the sound is too tubby, cut around 200 Hz. A "small room" reverb is currently popular on the snare. Fullness at 80 to 100 Hz. Sizzle at 10 kHz or higher. Roll off the lows below 500 Hz to reduce low-frequency leakage (unless you’re miking the whole set with the overhead mics). Boost at 2.5 kHz to 10 kHz for click. Filter out highs above 9 kHz to reduce leakage from cymbals. To remove the "cardboard" sound, cut at 300 to 600 Hz. I hope these tips help you capture all the drum’s power and excitement.